Everyone was rooting for Bobby Scales when he came up to the Cubs in 2009. He was a 31-year-old rookie who had really paid his dues in the minors (14 seasons). He briefly played well in a part-time role in the big leagues, filling in at third base, second base, left and right field. He also had a few dramatic clutch hits that made the fans rally around him. Unfortunately for Bobby, he had maximized his potential. He made his last appearance as a big league player on the final day of the 2010 season. Lary (spelled with one ‘R’) pitched for seven teams in an eleven season big league career including the Cubs in 1985. He was an all-star with Milwaukee when he won 18 games for them in the 1978 season, but by the time he came to Chicago he wasn’t the same pitcher. With the Cubs, Sorenson was converted into a reliever, pitching in 46 games. He was 3-7 with a 4.26 ERA and was released after the year. 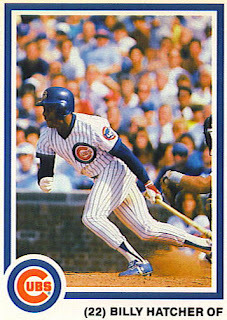 Walker was born in Chicago and eventually played for the Cubs as part of his major league journey. After washing out as a starter with the Indians, he was a reliever for the Cubs. In 42 games, he won one game, saved another, and posted a respectable 3.22 ERA. He became a free agent after the season and signed with the Phillies. Kelly was a righthanded pitcher who came up with the Cubs and pitched as a swing-starter for two seasons, and part of a third. The Cubs traded him to the Reds in the middle of the 1953 season for Bubba Church. Kelly couldn’t have been thrilled with the trade. He was sent to the minors shortly after arriving in Cincinnati and didn’t return to the big leagues until five years later. Like every other baseball player with the last name of Rhoads, Bob was nicknamed “Dusty”. He was a 22-year-old rookie with the Cubs (then known as the Orphans) and started 16 games for them in 1902. That team had six players who would eventually go on to win the World Series for the Cubs (Tinker, Evers, Chance, Slagle, Kling, and Lundgren). The Cubs traded Dusty to the Cardinals the following April and he pitched eight more seasons in the big leagues. His best years were with Cleveland, where he became a 20-game winner. Gardner was on the same pitching staff as Rhoads (above), but he didn’t pitch as much. The 28-year-old was only given three starts. He completed two of them. Those were the last two appearances of his big league career. He also played in the field earlier in his career (2B, 3B, OF) for Pittsburgh. If you want to travel back in time to watch France pitch in the big leagues, set the wayback machine to July 14, 1890, and go to Brooklyn. He pitched two innings for the Cubs (then known as the Colts) and gave up three runs in a 10-3 loss. It was his only appearance in the big leagues. 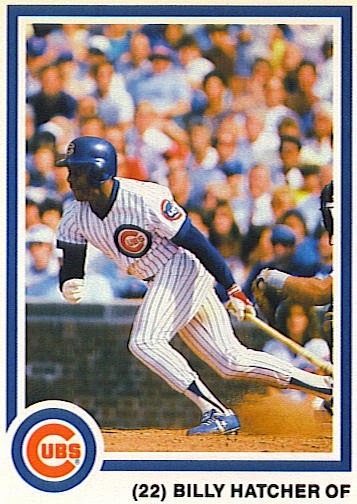 Hatcher was a bright young prospect in the Cubs system who came up at a time that the outfield was crowded with veterans. He was traded to Houston, and it didn’t take long for the Cubs to realize they made a mistake. Billy Hatcher turned out to be a postseason juggernaut after he left the Cubs. He led the 1986 Astros to the NLCS and hit a dramatic homer in the bottom of the 14th inning of Game 6 to tie the game against the Mets. But he will always be remembered for his performance in the 1990 World Series. Hatcher hit an incredible .750 for the series (9 for 15) and helped lead the underdog Reds to a sweep of the heavily favored Oakland A’s.